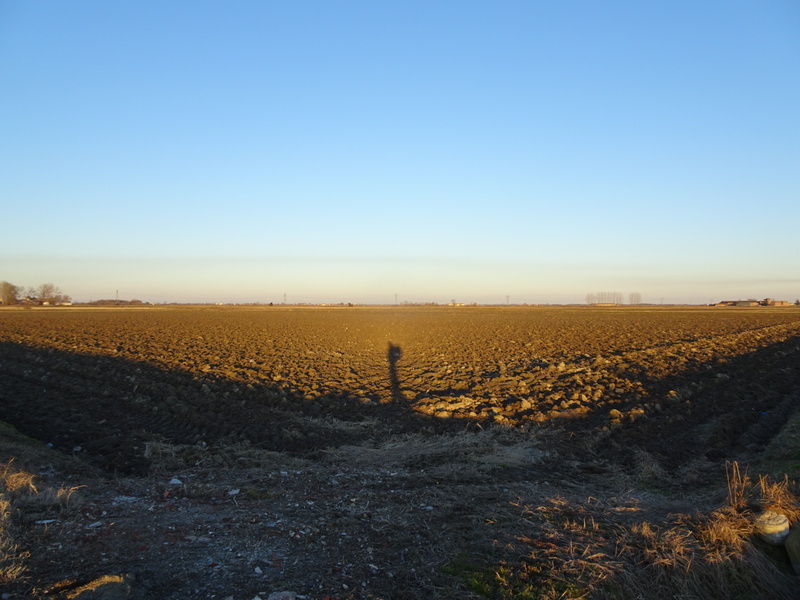 The road stretches south from Vercelli, flat and unforgiving. No sidewalk, not here where the city crumbles away. I walk along the shoulder, then find a short section of abandoned pavement that will buy me a few hundred meters before it joins the road again. A fruit stand sits at the junction in the distance, the last bit of the city, just a truck and a bunch of crates set up at the edge of town. Fields, empty for winter, stretch away to the horizon. Cars are thin at least, but that doesn’t make the pavement softer. My feet already hint at aching from the hard packed dirt road I walked along the river. The rocks dug into the soft bits and left the joints worn. I stare at the pavement as I walk, slumping, wondering how long before each step hurts. “You always knew roads would be part of the deal,” I tell myself. “But that was when they were far away,” I answer. My voice is distant. My feet and the grinding road are close. I walk on, eating a piece of chocolate to distract my mind. The mountains I left have faded into a crust on the horizon. The pyramid to the west now stands clear in the distance, still small, no bigger than the mountains I came from, but no longer half ghost. To the south, in front of me, I can just see a few hills rising from the far side of the Po. Two men load the fruit stand as I pass, stacking crates of oranges and clementines in the truck. One sees me and shouts something in Italian. I look up and shrug in apology. The man nods and hops down. He speaks some Spanish. “Are you going to Santiago?” he asks. I nod. I am going to Santiago. Then on to Finisterre, to Portugal, and down to Tarifa. The man translates for his friend then asks where I started. Then I tug on my beard and point to their clean-shaved faces. I flick on my phone and show them a picture from Finnmark. “I looked like you then,” I say. One translates for the other. They laugh and shake my hand. Then they talk to each other and point at the crates of fruit. I try and shake my head but they are already grabbing handfuls of clementines and oranges and shoving them toward me, one after another, piling them up until I cannot hold any more. My fingers spread wide, filled with fruit and the chocolate bar I was eating. I try to offer them a piece, but they refuse, holding their stomachs like they are full and shaking their heads. “No, no, no,” they protest. I look down at the pile of clementines and oranges in my hands, then up at their bright smiles and nod. They wave as I walk away, then go back to loading the truck. I stuff my pockets to free my hands, then peel clementines and oranges as I walk the road. The juice is cold and sweet. The hills rise to the south. My feet don’t hurt until the last slice is gone. Posted in Europe North to SouthTagged backpacking, ENS, Europe North to South, featured, Italy, thru-hiking, trail magicBookmark the permalink. Ciao Bella!!! Italians are wonderful!!! Great Post!!! Fish, chocolate, wine, oranges, pretzels, clementines, etc, Oh My!! The Yellow Brick Road has been good to you. The scenery and the sites are wonderful but the real memories come from the stories about the people you meet on your journey. Enjoy Italy!